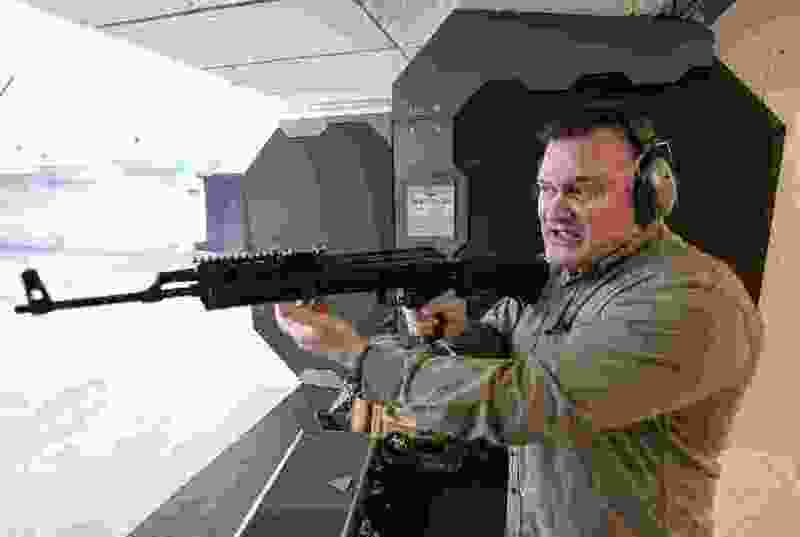 (Francisco Kjolseth | The Salt Lake Tribune) Utah gun rights advocate Clark Aposhian, one of only a handful of Americans who are legally allowed to keep their bump stock, a shooting accessory that alters semi-automatic rifles to fire in quick bursts like a machine gun, demonstrates how it works on an AKM-47 at a gun range in Murray, UT, on Thursday, April 4, 2019. He is challenging the bump stock ban in court, and an appeals court has allowed him to keep his bump stock until his case is resolved in court. Clark Aposhian, a resident of Utah, is now the last man in America who can legally own a bump stock. Last month, a formal bump stock ban went into effect. The ban ordered anyone who lawfully purchased one of these devices to either surrender or destroy it, or else face felony prosecution. In a surreal bit of doublethink, ATF now insists that every bump stock previously sold was always a machine gun. So, not only are bump stocks now banned, but the agency claims it could always have prosecuted the owners of these devices — even though they were sold with ATF letters of approval attached. To reach this absurd conclusion, ATF had to promulgate a bump stock rule that changed the statutory definition of “machine gun.” Under the new rule, a semiautomatic weapon is a machine gun if the shooter fires by bumping the trigger instead of “pulling” it. The new rule also defines “automatic” fire to include firing that requires “additional physical manipulation” of the weapon between shots, which used to be considered “manual” fire. Notably, “the government expressly disclaimed any entitlement to Chevron deference” and “went so far as to indicate that … it would prefer that the Rule be set aside rather than upheld under Chevron.” This concession came because the government knows its reading of a criminal statute is not entitled to any deference. But the court decided ATF was not allowed to waive Chevron deference and ruled in ATF’s favor on that basis, even though it would result in making half a million law-abiding citizens into criminals. This brazen abdication of judicial independence shows just how unlawful much of modern administrative activity is. Article I, Section 1 of the Constitution vests “all” legislative power in Congress. No part of the Constitution allows a law enforcement agency to rewrite a law it disagrees with, nor does it allow a federal court to sit idly by while that same agency prosecutes citizens for violating the new, made-up law. Aposhian’s challenge continues. The Denver-based 10th Circuit Court of Appeals temporarily enjoined ATF “from enforcing the Final Rule against Mr. Aposhian” while his case proceeds, leaving him as the only private citizen with a legal bump stock. His case offers the best remaining hope for stopping lawmakers from passing the buck to the executive branch on this difficult issue. Caleb Kruckenberg is Litigation Counsel at the New Civil Liberties Alliance, which has filed legal challenges to the bump stock ban that are pending in the 10th Circuit and the Western District of Texas. The Salt Lake Stallions and the AAF have left broken bones and broken lives in their wake. Ex-Ute Gionni Paul and others are picking up the pieces. This week in Mormon Land: A fourth African temple, the ethics of missionary work, a Utah ‘Brexit'?